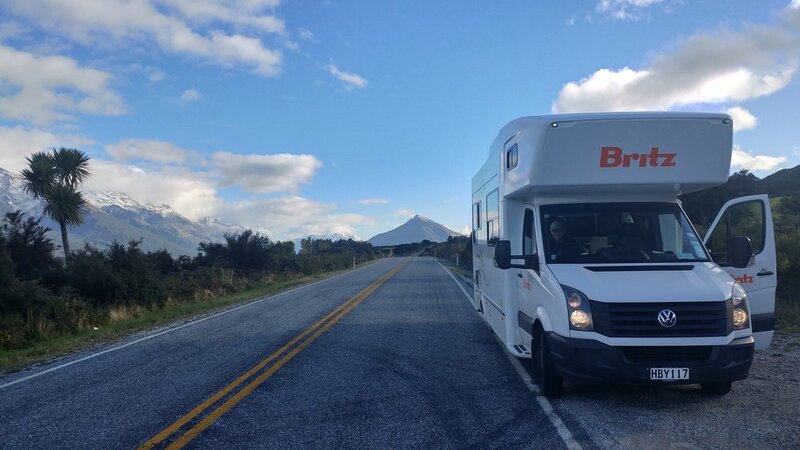 Having said goodbye to our motorhome in Christchurch, we discussed its shortcomings. Obviously, being a rental vehicle, it is going to have a lot of wear and tear and potential problems. In the process of dropping off the motorhome, within the space of ten minutes two other people returned theirs who had also had problems – one had resolved itself though. However, the customer service we had from Britz was excellent when ours got a plumbing fault. There are some things to be aware of with motorhomes. You will have to empty the cassette toilet, so if you haven’t got someone in your party with a strong stomach, don’t even consider a motorhome. Motorhomes are noisy. Things rattle around as you drive – the grill for one. We tried stuffing a tea towel into the grill area with minimal effect. You have to be prepared to drive long distances and keep pulling over to let people pass. The roads are quieter than the ones in the UK but you can still get a build-up of traffic behind you. ‘NZ roads are different, allow more time’ signs inform you. Yes, they can be winding (on the way to the Abel Tasman Track area they are winding and uphill) but there are also some long, straight stretches, as there are on the way down the West Coast. You can get a move on then. But basically, you have to be pretty committed to some serious driving if you have about two weeks in New Zealand like we did and want to see a lot of the South Island and some of the North. Four to five weeks would give ample time. In two weeks we covered 3,874 kilometres, meaning we had to pay $256 for the road user charge at the end. In 2003 we bought our own Mitsubishi Canter 4-berth motorhome when we toured New Zealand. The motorhome was built on a truck chassis and had smaller height and length dimensions compared to the Volkswagen 'Britz Frontier' we hired this year. The Mitsubishi was brilliantly manoeuvrable - you could fit it into a standard parking bay and it had an excellent turning circle. The Volkswagen Britz Frontier felt unwieldy and bouncy. In fairness, you are going to get this with a big vehicle. The Mitsubishi had a good interior layout that felt spacious. The Frontier was adequate but cramped in certain areas. The shower/toilet room was not so well designed or as roomy. It was also tight for space between that room and the kitchen area, because of the preference given to seating/sleeping areas in this 6-berth motorhome. Seating was just in the areas near the front of the vehicle. There was no option to sit in the back and look out of the big window. The Frontier - because it was more modern, obviously - had a reversing camera which was a good safety feature. A Sat Nav was available. What a brilliant invention. We got lost so many times in our old Mitsubishi. However, there is a sort of alternative to the Sat Nav. The Rankers app installed on my phone meant we were able to follow our progress via GPS because I bought a New Zealand sim card at the airport. The little blue dot showed where we located on the map and you could search for anything from playgrounds and camp grounds to petrol stations, dump stations and supermarkets. A good feature was Top Ranked Activities. Britz also do their own Roadtrip app which had a few different search possibilities such as laundromats and public toilets. However, it didn’t work offline. You have 1GB of data available via WiFi through the Sat Nav but it is very temperamental. In summary, we felt that the Britz Frontier was worth hiring and as a family of four we definitely needed the space. If we had been six it would have been uncomfortable. One of the beds had cushions missing, though I’m sure it could have been sorted by Britz. But I recommend checking everything over thoroughly before you set off.